The Wizarding World of Harry Potter is spread across two theme parks at Universal Orlando: Hogsmeade at Universal's Islands of Adventure and Diagon Alley in Universal Studios Florida. Both offer many magical things to do and see. There's the first-class rides like Harry Potter and the Forbidden Journey, Escape from Gringotts and the Hogwarts Express. There are also live shows and entertainment, unique dining and shopping options – and of course Butterbeer! Here's our list of the ten best tips for planning your trip to the Wizarding World. A good wizard is never late, so get an early start. Universal Orlando always offers early entry for on-site hotel guests at one of the parks. If you're not staying on-site, a good tip is to find out which park is offering early entry, and then go to the other one first. The park with early entry will already have lines for the Harry Potter attractions by the time you arrive, so start your adventure at the other one to avoid the wait. You can check the official Universal website's hours page to see which park has early entry that day. Once you arrive, head straight to Forbidden Journey at Hogsmeade or Escape from Gringotts in Diagon Alley. The lines are shortest when they first open and again during the last hour of the day. Both rides offer single rider lines too. Waits will be less but your party will be split up. You'll miss out on the main queues this way, which you have to see at least once since they're like attractions themselves. You can ask for a "castle tour" at Forbidden Journey just to explore the highly themed queue. Single rider lines are especially great for re-riding. 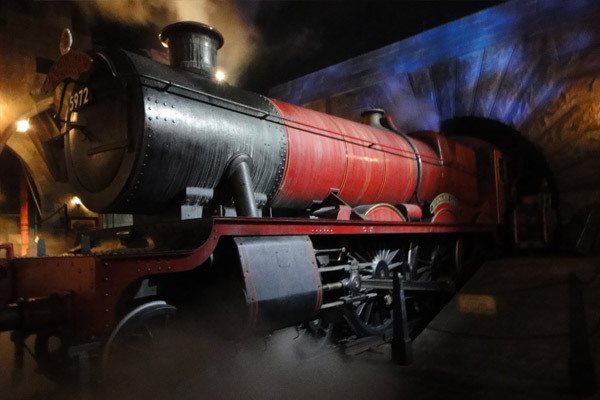 The Hogwarts Express is one of the best Harry Potter attractions. In fact, it's actually two rides! The journey from London to Hogsmeade and back are two completely different experiences. The only way to ride the train is for everyone in your party to have two-park passes; tickets that allow you to visit both Islands of Adventure and Universal Studios Florida on the same day. If your ticket is for only one park you'll be missing out on one of the greatest rides that the Harry Potter lands have to offer, so keep that in mind when planning your visit. Selecting a wand is an important experience for every young wizard. Ollivanders is of course the finest makers of wands since 382 BC. They have locations in both lands, but their flagship store in Diagon Alley will have the shortest lines. That's because they have more wand selection theaters than Hogsmeade and are able to serve more customers per hour. With an interactive wand you'll be able to cast spells in various spots throughout the Wizarding World that activate effects in windows and more. While in Diagon Alley, stop by the Gringotts Money Exchange. Here you can talk to the goblin banker behind the counter and even trade in your regular muggle currency for real Gringotts bank notes. They're available in $10 and $20 denominations and come in an official Gringotts Bank sleeve. They can be kept as a fun souvenir or you can actually use them to make purchases at stores and restaurants in both Wizarding World locations, and everywhere else at the Universal Orlando theme parks! Tucked away down a dark corridor in Diagon Alley you'll find Knockturn Alley, where the more shady and sinister wizards tend to shop. Borgin and Burkes is found here, a shop filled with Death Eater masks, skulls and other spooky souvenirs. You can see the Vanishing Cabinet from the films inside this store. Knockturn Alley can easily be missed so seek it out and explore this unique area where it's always nighttime, even during the day. There can be long lines to purchase Butterbeer at the outside carts and snack stands. Instead of waiting out in the hot sun, pop into the Hog's Head pub in Hogsmeade to get your Butterbeer. Not only will the line be much shorter, but you can enjoy it in the cool air conditioning or out on the back porch with beautiful views overlooking the lagoon. 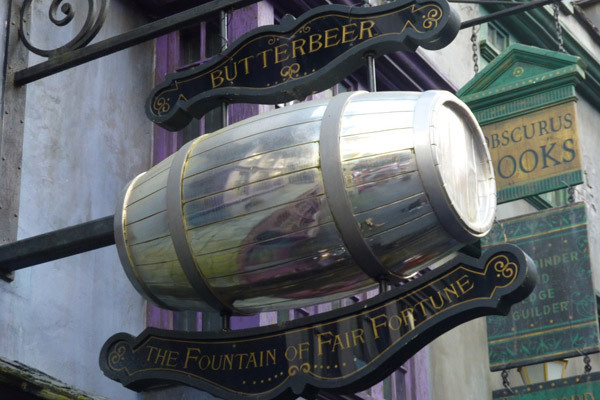 In Diagon Alley you can get Butterbeer at the Fountain of Fair Fortune or The Hopping Pot. If one has a long line, try the other. Not only does this little shop in Hogsmeade offer cute owl plushes, stationary and writing supplies like quills, seals and ink, but you can actually mail a real letter from here. When you mail your letters or postcards from the Owl Post they will receive a special Hogsmeade postmark! This is great for showing off to everyone back home that you're actually at the real Wizarding World. Both lands offer their own unique restaurants: The Three Broomsticks in Hogsmeade and Leaky Cauldron in Diagon Alley. They serve traditional British fare inside dining rooms that look like they're right out of the movies. The lines to order food can be long during the lunch rush of noon to 2pm. It's a good idea to schedule your meal either when they first open, around 11am, or after the rush, around 2:30pm. That way you can enjoy the atmosphere and wait less for your meal. No trip to Diagon Alley would be complete without a visit to Florean Fortescue's Ice-Cream Parlour. The Butterbeer ice cream is a must-try, but they also offer other unique flavors like Sticky Toffee Pudding, Earl Grey and Lavender and the spicy-sweet Chocolate Chili. There are also sweet shops in both lands that offer delicious treats like Pumpkin Pasties, Cauldron Cakes and of course Chocolate Frogs! 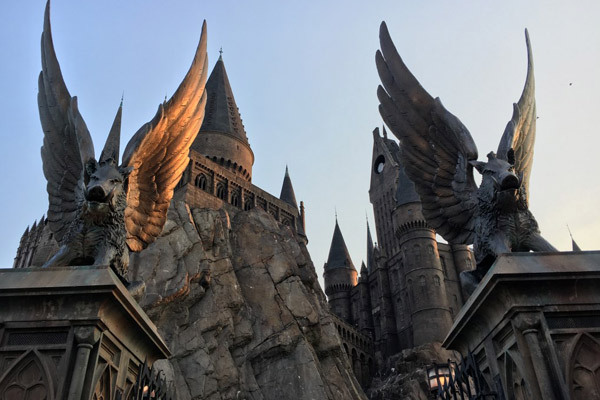 If you're planning a trip to the Wizarding World of Harry Potter, look no further than Best of Orlando for your discounted tickets to Universal Orlando!